Now that all the pieced blocks are done, you are well on your way to completing this quilt. I think the blocks take the most time for precise piecing. It’s nice to have that all done. 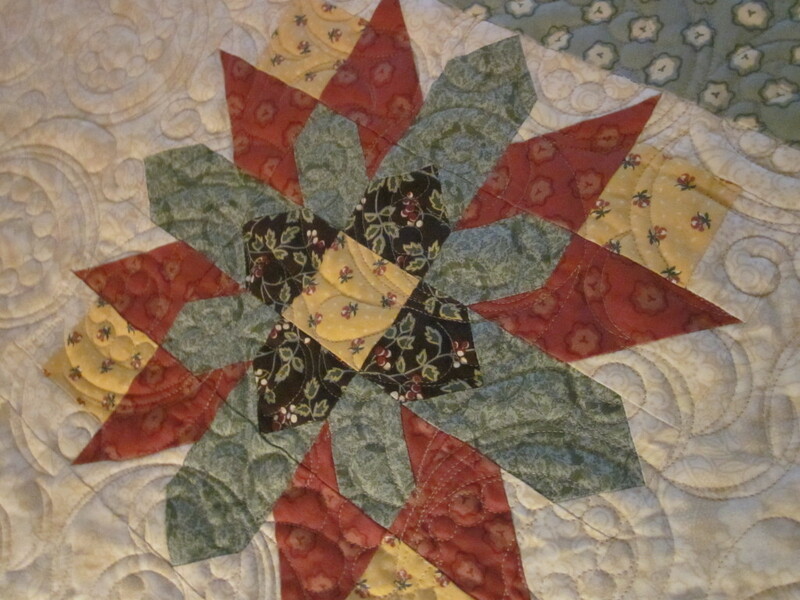 Painted Daisy Quilt; Week 2 – Section II focuses on cutting the center green squares and the side and corner triangles so that you can proceed to sewing the blocks, side triangles and green center blocks together in diagonal row. Note: the side and corner triangles are cut a bit larger than needed, giving you the opportunity to trim so you have a perfect quarter inch seam allowance and very straight edges on all four sides of the quilt before attaching the borders. Refer to the diagrams under the section titled Trimming Side and Corner Triangles. This is the point which pays to be precise because it will make the next 6 borders fit perfectly. All of the pieced borders balance the center of the quilt in a graphic bold fashion and make a lovely drop off the side of the bed with the pieced design centered on the top of the bed. I am looking forward to seeing the fabric selections you’ve made for this quilt. Share your pictures with me at lynette@thimbleberries.com. Tops only are accepted, but I do hope you eventually get yours quilted. In Section III, I will talk about batting and quilting design choices. I am going to try something new for the next three weeks…a Quilt Along. 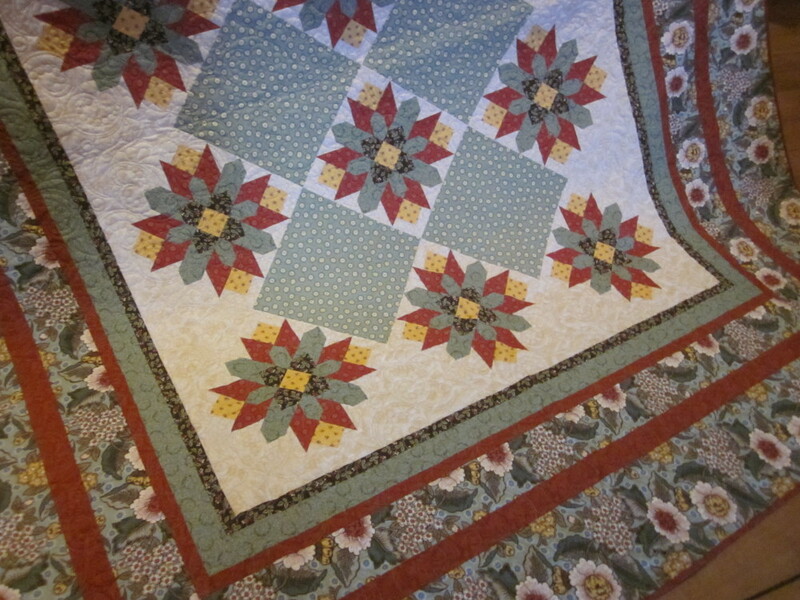 This lovely traditional Painted Daisy queen size quilt was made by Sue Bahr with my Home Again Fabric Collection. The pattern does not exist in any other past publication. 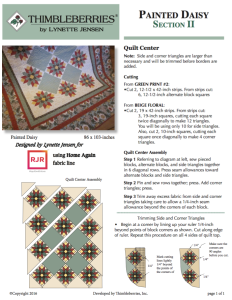 I will be posting instructions to make this quilt starting Monday, March 21st. The quilt instructions will be divided into three sections, one week apart. Section One – March 21, Section 2 – March 28 and Section 3 – April 4th. You can download the instructions on those dates. If you keep up with the sections, you’ll have this lovely quilt sewn in just three weeks. If you want to use the same fabrics as shown, check out your local quilt shop for the Home Again Fabric Collection. If unavailable in your location, call Quilt Haven on Main at 888-843-8251 or 320-587-8341. You may have a whole stash of Thimbleberries fabrics that would also work in this quilt. To prepare for this Quilt Along you may need this week to gather or order your fabrics. Please see Fabrics and Supplies below. 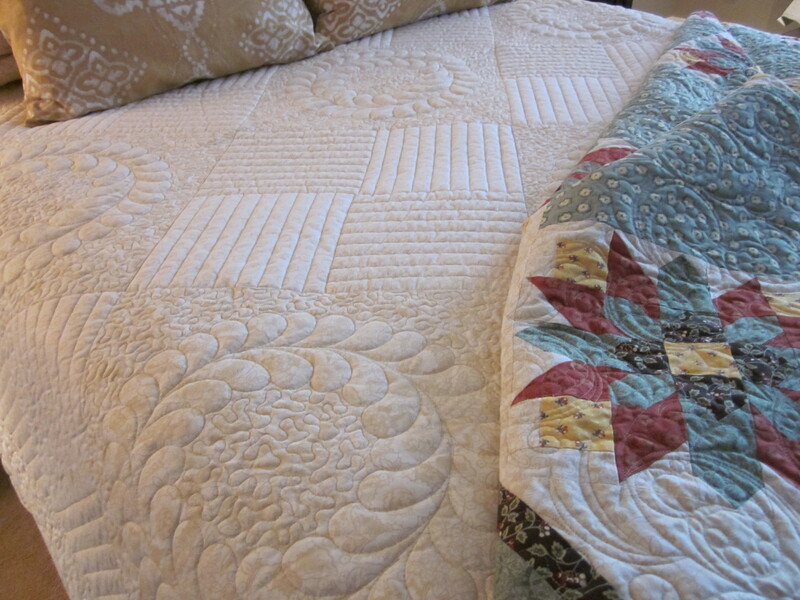 Here is the quilt again used with the Heirloom Winter White quilt from last week’s post. I hope you join me in stitching up this great quilt to add to your Thimbleberries quilt collection. Dressing a bed might sound like an odd thing to do, but I admit it is one of my favorite decorating activities. 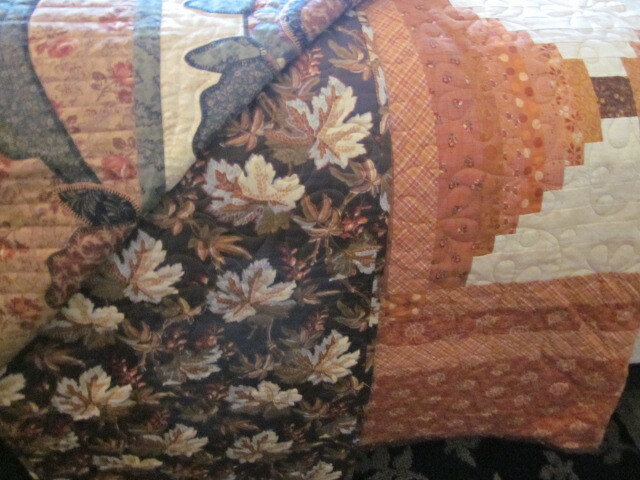 I know it is because I like to combine fabrics and prints and because I have many quilts to display. I bet you do too. Also, it is the fastest way to redo a bedroom and most economical because you have already made the investment in the elements used. On beds that don’t get slept in on a daily basis, I go all out and layer them with pillows and multiple quilts. The very best quilt design that I came up with years ago was a tonal, neutral quilt with beautiful quilting that I use as a base for the wonderful quilts I coordinate it with from season to season. It turns out to be a great investment that allows me to have a year-round neutral quilt that works with every season and every size quilt…even large wall hangings, long table runners and throws that would otherwise never get displayed on a bed. 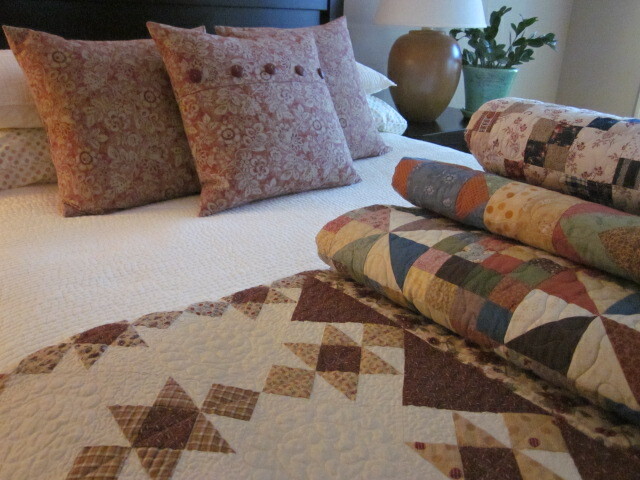 It is a great way to get more use from all the quilts you have made that don’t fit your bed. The basic quilt I am referring was originally titled Garden View and it was from the project book Orchard Quilts. 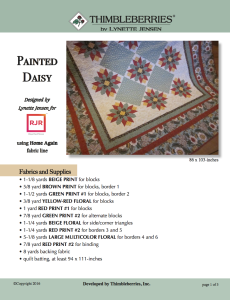 It was republished in the project book Easy Living Quilts…both published by Thimbleberries. 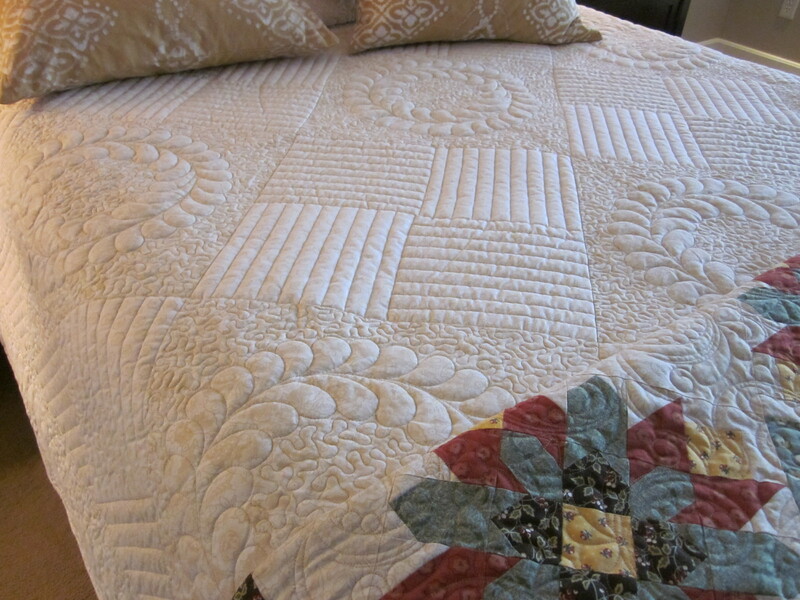 I now refer to it as the Heirloom Winter White Quilt, as it has become an heirloom. By the way, this is the perfect wedding quilt. It will go with any color palette the bride and groom might have now or in the future. Below is a picture of it showing off the beautiful machine quilting done by Connie Albin at Turnberry Lane Quilting in Northfield, MN (connie@turnberrylanequilting.com). 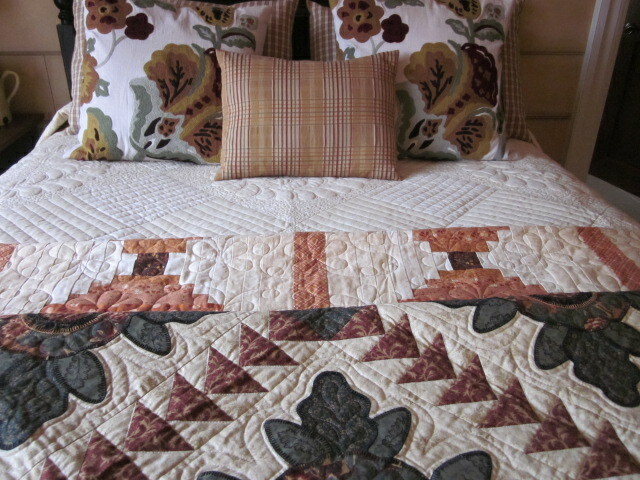 This photo is taken in our bedroom with one of my new quilts from the recent Home Again fabric collection. The setting below is the same quilt, but layered with my winter color palette. Here, it is in the guest bedroom. I can layer it full of pillows and quilts without needing to move everything off at bedtime. I think that might get a little irritating, especially for the man of the house, but it sure looks great as I walk by the room many times a day. The folk art appliquéd quilt was made by the Macon County Quilters Guild many years ago for their raffle quilt that I actually purchased from the raffle winner of the quilt who did not like quilts featuring black fabrics and primitive appliqué. I, on the other hand, love both. It is a real treasure to me and one I would probably never make. I also knew many of the members of the guild who worked on the quilt which makes it even more special to me. 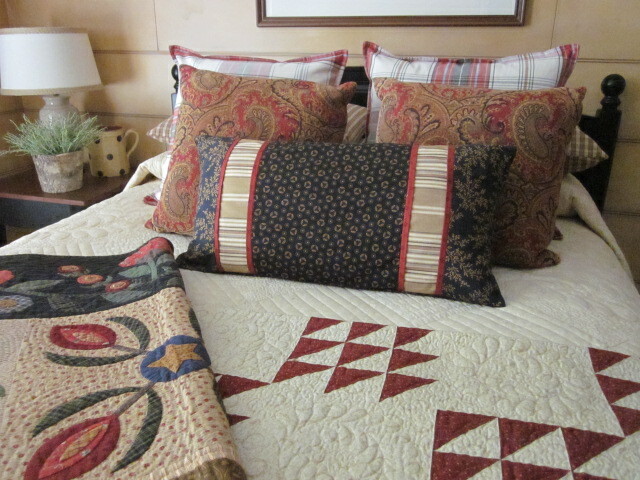 Other quilts on the bed are from my fabric collections…the red and white one is Two Colors, Too Easy from the project book, Evergreen Inn and Berries and Blooms Log Cabin (see second picture below) from Collection of Classic Quilts available at Landauer Publishing. 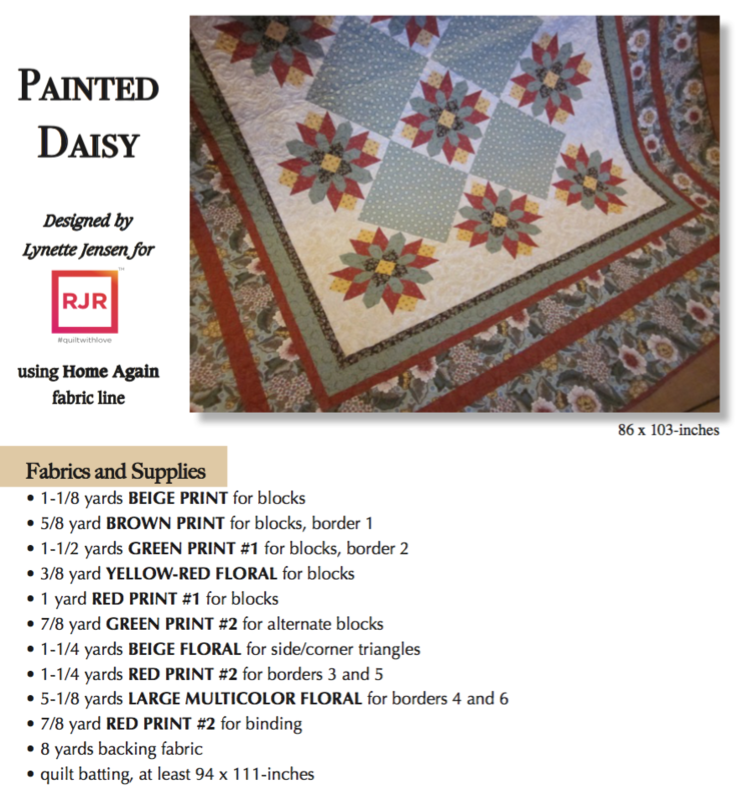 If you are interested in making the Garden View tonal heirloom quilt, and would like to purchase a kit, my local quilt shop, Quilt Haven on Main in Hutchinson MN, would be happy to help you out. Ask for the Thimbleberries Garden View quilt kit. They have beautifully package kits from Thimbleberries new neutral fabric collection, Sand and Stone. The price of their kit for fabric only is $160.95 and with an Easy Living book included. $176.95. Please call them if interested at 888-843-8215 or 320-587-8341 for shipping details. If you want backing that matches this quilt, have them add it to your order. You’ll find Garden View to be one of the best quilts in your collection. It can be use with so many other quilts to change the look of a room in a flash. Here are a few views of my fall color palette. 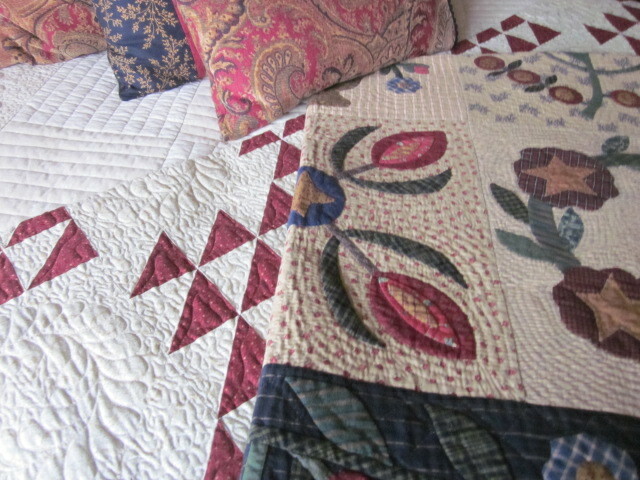 I have also used a long, whole cloth table runner with the quilts that is visible from the side of the bed. The embroidered pillows are from Birch Lane catalog and I made the checked shams and plaid small pillow from leftover decorator weight fabrics in my stash. The apricot Courthouse Log Cabin is from Scrap Quilts available from Landauer Publishing and the appliquéd quilt is Holiday Bouquet from Collection of Classic Quilts, also available from Landauer Publishing. Perhaps many of you already have these quilt books in your library. I really do love how quickly this room changes by just switching out the pillows and quilts. Below is another idea for displaying quilts on a bed. I like to roll up quilts into bedrolls and combine a group of coordinating quilts at the foot of the bed on top of another quilt that covers the width of the foot of the bed. It is always fun and rewarding to see hand made quilts displayed rather than stored in a closet or trunk. 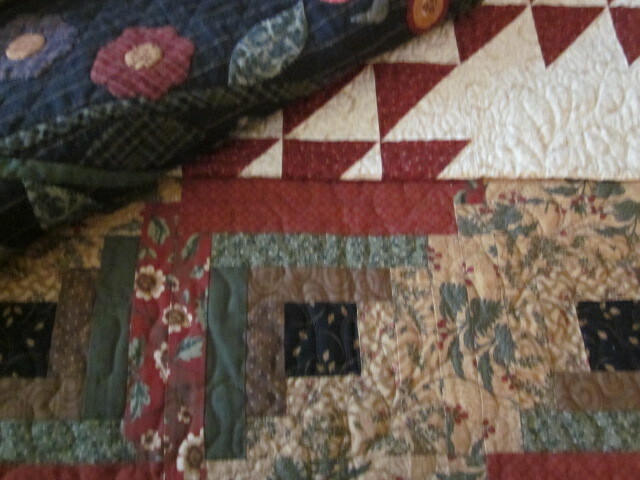 An antique quilt has been added to the mix. The quilts on this bed are Golden Rod Patch from The New Collection of Classic Quilts, then Scrap Patch Paddlewheel quilt and Jelly Bean quilt from Scrap Quilts book, both available from Landauer Publishing. Dig out your quilts…give them some air….refold them and have some fun displaying and enjoying their color, the patterns, the fabrics and all of your loving stitches.